Car sales for January show that 191 registrations are down 12.6pc (32,374) when compared to January last year (37,023), writes Trish Whelan. The figures, released today by The Society of the Irish Motor Industry also show that it’s a similar story for Light Commercials which are down 16.3pc (5,650) versus January last year (6,753) and Heavy Goods Vehicle (HGV) registrations are also down 11.4pc (356) in comparison to January 2018 (402). Used car imports for January 2019 (9,006) have seen a very slight drop of 0.6pc on January 2018 (9,061). Electric vehicles sales are up significantly with 811 registrations last month which is more than for the whole of 2017 and over 60pc of the total for the whole of last year. These sales have increased from less than 1pc of the market last year to 2.6pc market share in January this year. Diesel continues to be the market leader so far this year with a 49pc share despite an 8pc decline on January 2018. Petrol has grown to 40pc and Hybrids currently account for 7pc of the new car market. The five top selling car brands for January 2019 were: 1. Hyundai, 2. Volkswagen, 3. Ford, 4. Toyota, 5. Nissan. The five top selling car models for January 2019 were: 1. 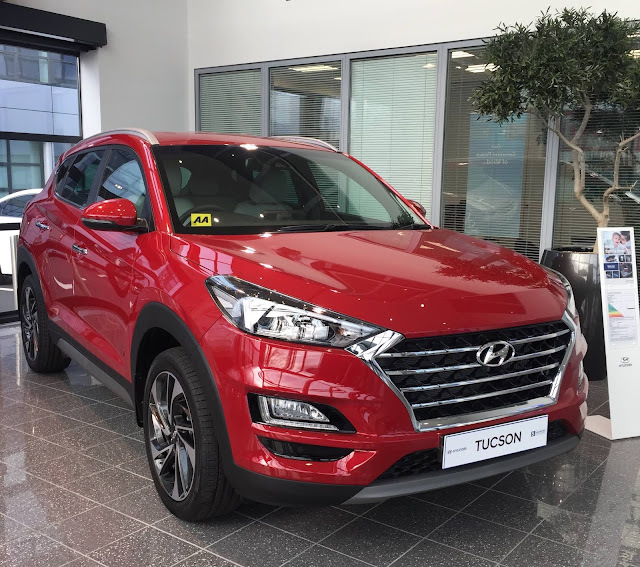 Hyundai Tucson, 2. Nissan Qashqai, 3. Ford Focus, 4. Toyota Yaris, 5. Skoda Octavia. The top selling car for January 2019 was the Hyundai Tucson (pictured above).